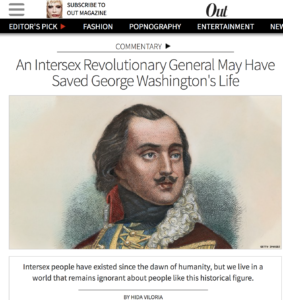 My latest essay, in OUT, about what the news that Revolutionary War hero Casimir Pulaski may have been intersex says about surgeries aimed to “fix” intersex kids and the military trans ban. I also discuss California’s groundbreaking legislation SB 201, which seeks to ban these surgeries, and how doctors have used false claims to support their arguments against the ban. U.S. Judge Rules in Favor of Nonbinary Passport! Born Both Mentioned in Fantastic Article for Intersex Allies! Born Both Reviewed by the New York Times! Rave Review of Born Both in The Washington Post! Born Both Selected as one of People’s Best New Books! Born Both listed as one of the Culture Essentials for March! Born Both Makes Bustle’s 20 Best Nonfiction Books of March List! Quoted in UN’s Intersex Awareness Campaign! Published in new college textbook by Oxford Univ. Press!